There are various different forms of sign language for children, parents and care professionals to use as a means of communication and one of these is Makaton. But what exactly is it, how can it be used and who can benefit from using it? Makaton is a form of communication system that involves the use of a series of signs, symbols and speech to help people communicate. The signs and symbols have been specially created and, rather than completely replacing speech and writing, they’re designed to help support them. It’s a very simple form of communication method and, as well as signs and symbols, it involves the use of lots of gestures, facial expressions, eye contact, body language, words and speech. 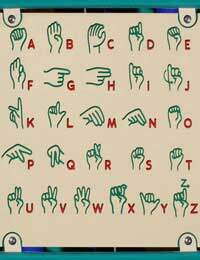 In fact, this is one key way in which it differs from other forms of sign language, such as British Sign Language (BSL), as it actively encourages speech and words, whereas BSL is primarily used for deaf people and doesn’t need to be spoken. Makaton is used a lot to help children or adults with communication and learning difficulties and is a great way for carers or childminders to interact with young children in their care. Who Benefits From Using Makaton? One of the major benefits of Makaton is that the system is particularly useful for those with learning or communication problems to express their thoughts, needs and feelings and communicate with those around them (obviously, dependent on them having learnt the system too). In the case of a child with learning difficulties who isn’t yet able to verbally express themselves, Makaton can be very effective for helping them communicate their needs or interest. Simple symbols, such as images of activities, foods, games or drinks can be used and, at their most basic, a child can point to them. A parent or carer can use the Makaton system to ask a child if they’d like a piece of fruit, by signing the word fruit and asking the question at the same time. Alternatively, they could show the child a picture of a piece of fruit, such as an apple, banana or orange, and ask them a questions about they’d like some. By asking the question alongside using signs and symbols, the communication is reinforced. For those children that may go on to learn more speech, hearing the words too can help aid their learning process. How Can You Learn Makaton? If you’d like to have a go at learning Makaton, whether to enhance your work with children or to use at home with your child, then it’s an easy and informative system to get to grips with. The best way of learning it successfully is to attend a short training course. There are numerous training courses available and you’ll learn the key aspects and how to put the use of signs, symbols and other communication forms together. If you’re already familiar with British Sign Language, then you should find Makaton easy to learn, as the Makaton signs are inspired by BSL signs. What are the advantages of using makaton. Makaton is helped by having the action exactly the same as what you would do if you were holding that exact object. what are the advantages and disadvantages to makaton?